On my birthday, I always like to wear something really pretty, that makes me feel very girly and fun. Last year, I wore my purple satin skirt with gold shoes (and was very overdressed for an all-day work orientation, but whatever). This year, I’m writing this before my birthday (true confession, I usually write these posts in advance – it’s the only way I can get them done!) I really want to wear one of my sequin skirts, but that’s generally frowned upon in academia. So, I’ll probably wear this pretty skirt again, because I love it, and what’s more feminine than a long tutu (let’s be realistic, that’s essentially what this is). 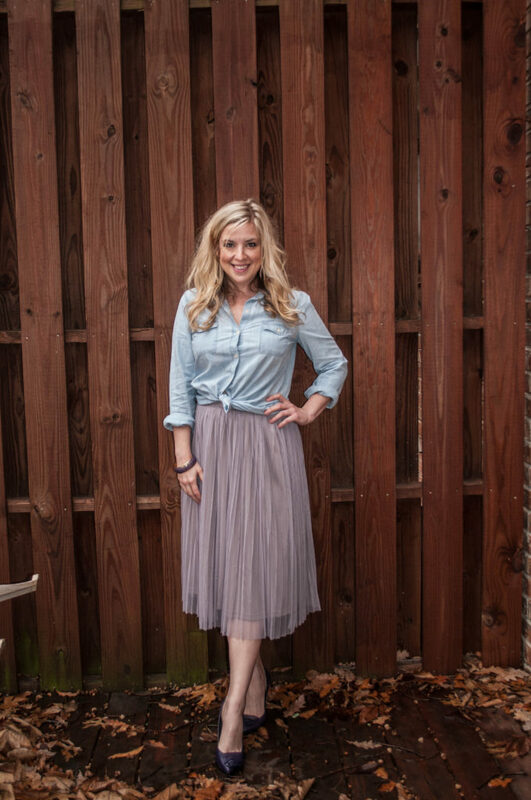 I’ve talked before about how much I love mixing high and low style – the chambray and the tulle are a perfect juxtaposition to each other. (Side note, does anyone remember that store in the mall? It took me FOREVER to learn how to say that word as a middle schooler. But that didn’t stop me from shopping there!) The lavender-gray of the skirt isn’t something I have a lot of in my closet, but I think it’s a pretty color, and purples are easy to blend, as you can see with my shoes here. How do you all celebrate your birthday? It may not be with fashion, and that’s okay! But, if you do have something particular you like to wear on your special day, I’d love to hear about it!